Dallas Hale has been in the bar/restaurant industry for decades, holding every position you can imagine. He worked his way up from a bartender, to GM of a restaurant, to a restaurant owner, to a multi-unit restaurant owner with franchises. Today, Hale is the president and CEO of Texas-based Crafted Bar Concepts which includes Shell Shack, Sushi Marquee, and Back 9, totaling 10 restaurants and 15 franchises. When Hale bought what was to become the first Shell Shack back in 2013, the first thing he did was call Danny Vaughan, GM of Future POS Texas, to replace the old POS system with something new from Future POS. “I’ve been using Future POS since 1999 and have complete trust in the features, reliability, and willingness of the company to support me,” says Hale. As time passed, Hale began opening additional Shell Shacks and new restaurant concepts, each time ensuring Future POS was the backbone of his operation. Each restaurant has a mix of traditional fixed POS terminals and iPads for tableside order entry. Future POS was able to leverage its industry relationships and clout of its parent company, Shift4, to quickly identify a potential pre-certified hardware solution and get the Shell Shack into a beta. 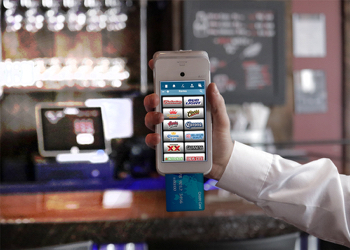 Shell Shack is using the Android-based PAX A920 payment tablet terminal. The device checks all of Hale’s boxes and more, including contactless payments and EMV. When Wi-Fi is unavailable, the unit relies on 4G/3G to process credit cards. At the end of a day, when the unit is brought back to the Shell Shack network, the unit connects to the POS database to update sales and inventory numbers. The promise of the PAX A920s is so high that they are also being considered to replace the iPads in existing restaurants. Future restaurant locations will most likely open with A920s. Shell Shack’s mobile kitchen is just one example of how Hale’s concepts focus on engaging the community and customers to create loyalty. Another example is Service Industry Night, when those in the service industry can dine at Shell Shack at a discount. To help spread the word, Hale relies on Future POS’ built-in CRM, marketing, and loyalty functionality. Service industry professionals can sign up for the program and be alerted to upcoming nights and promotions. Each member receives a barcoded key tag that, when scanned, provides meal and drink discounts. This functionality can, of course, be used to create membership programs for other groups. The POS software has the ability to adjust price levels based on a guest’s particular membership. Back in 2015 when the EMV liability shift took place, Hale, like many restauranteurs, wasn’t exactly sure what impact, if any, it would have on his business. When it was determined that he needed an EMV upgrade, he says Future POS had the EMV update wrapped up in days. Reliability, support, and partnership — Many restaurateurs live a reality where their POS system lacks functionality, isn’t reliable, and their vendor doesn’t provide outstanding support. For Crafted Bar Concepts and Future POS, those words define the relationship. Future POS is one of the top 5 point-of-sale software packages for the hospitality industry and regularly wins prestigious awards such as 2017 Gold Vendor of Excellence Award in the Software Category by Retail Solutions Providers Association. Our award-winning software can be found in some of the most prestigious fine dining restaurants around the world, as well as single unit restaurants, bars, and nightclubs. Because Future POS is based on Microsoft SQL, it can run any size installation from a single terminal to a 77 terminal stadium.